Bed and breakfasts have long been the accommodation of choice for couples looking for a cozy romantic refuge and some of the best are located in Vermont's ski country. Discover the best New England skiing right here in Vermont! Vermont is where skiing began in America and is where you'll find a wide variety of great ski resorts. Vermont has been at the forefront of American skiing from the very beginning, and retains the cozy feel of New England tradition spiced with the best that modern life has to offer. The names of Vermont ski areas are legend, among them Ascutney, Bolton Valley, Bromley, Burke Mountain, Haystack, Jay Peak, Killington/Pico, Mad River Glen, Magic Mountain, Middlebury College, Mount Snow, Okemo, Smugglers Notch, Stowe, Stratton, Sugarbush, and Suicide Six. Throw in maple syrup, horse-drawn sleigh rides, Lake Champlain and Fort Ticonderoga, history and, in early season, the overwhelming beauty of fall sweeping over a landscape of New England farms and villages. Below see our picks for top Bed and Breakfast Resorts in Vermont. Most of us associate excessive snowfall with the northernmost reaches of the Green Mountain State; however, Southern Vermont is replete with ski areas and resorts that offer cutting-edge technology in snowmaking and a wide variety of trails, lifts, glades, and terrain parks. White House Inn - Wilmington, VT – The White House is a Victorian Mansion offering you elegant yet relaxed surroundings in Southern Vermont located near the Mount Snow Resort. Set on the crest of a high, rolling hill, and surrounded by towering hardwoods and formal flower gardens, it is readily obvious why the Boston Herald and New York Times selected the White House of Wilmington as "one of the ten most romantic places in the world." The White House has built its superb reputation by providing superior Southern Vermont accommodations exceeded in quality only by the meals preared in it’s restaurant. The three intimate dining rooms continue the pronounced Victorian theme of the Inn, and are the perfect surroundings in which you will enjoy an evening of award-winning gourmet dining. The Snow Goose Inn At Mount Snow - West Dover, VT – Sit and relax on our 3 acre wooded grounds, with stream, pond and informal flower gardens among the maples, pines and birch trees. 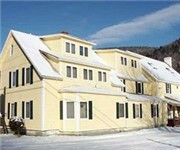 Our inn is situated in West Dover, southern Vermont a little over a mile south of Mount Snow, the closest large mountain ski-area to the larger cities in New England. Centered in the Green Mountains of Vermont the options for touring the area are endless, from kayaking our lakes and rivers through fishing, mountain biking, hiking, leaf peeping, to just relaxing or antiquing. For every season there is an adventure to enjoy in the clean & fresh air of the Green Mountains, whether your passion be winter sport, relaxing while fishing Lake Whitingham or playing 18 holes at either Mount Snow or Haystack golf courses. Concierge on site to assist in your planning. West Dover Inn Bed & Breakfast - West Dover, VT – The West Dover Inn is located in the rolling hills of the Green Mountains in West Dover, Vt. The Mount Ski Golf Club is less than two miles away, and the inn is less than four miles from the Mount Snow Ski Area. Horseback riding is available at the Winchester Stables, located approximately 14 miles from the property. The 12 guestrooms at the West Dover Inn feature hand-sewn quilts and period furnishings. All accommodations include private bathrooms. The inn's larger suite offers two bedrooms, a shared sitting room with a fireplace, and a private bathroom with a two-person jetted tub. The West Dover Inn was originally built as a stagecoach stop and tavern in 1846. A seasonally-changing array of gourmet dinners, fine wines and homemade desserts are available at the inn's restaurant. Pets are not allowed at this property. Bromley View Inn - Bondville, VT – With our lodging centrally located between Manchester, Magic Mountain, Bromley Mountain Resort and Stratton Mountain Resort. Our guests will find themselves in a Vermont activity haven with six top notch ski areas within one hour, over five golf courses within a half hour, superior hiking/snowshoeing with easy access to the Green Mountain National Forest, snowmobiling, cross-country skiing, snow tubing, kayaking, canoeing, and fishing; and of course some of Vermont's best shopping and antiquing in the towns of Manchester, Arlington, Londonderry, Weston, Peru, and Dorset. This lodge-style bed and breakfast offers a wraparound deck with sweeping views of the Green Mountains and the Bromley Mountain Ski Area. Two ponds are located on the property. Complimentary, full breakfasts, featuring stuffed French toast, are served each morning. Kokopelli Inn - Killington, VT – Kokopelli Inn and Spa in Killington, Vermont is just minutes from Killington and Pico Mountain Resorts. Journey back to the past and experience the rustic charm and relaxed hospitality of old Vermont at the historic Kokopelli Inn located in historic Killington, VT. At dinnertime, be sure to savor one of the many fine cuisines that make dining in Killington a world class culinary experience. Come to the Kokopelli Inn in beautiful Killington Vt conveniently located off Route 4, just minutes away from the slopes. And find out why more and more people are discovering Vermont's best secret. Echo Lake Inn Bed & Breakfast - Ludlow, VT – Echo Lake Inn is an Okemo bed and breakfast inn located in Vermont's beautiful central lakes region. Our romantic Vermont bed and breakfast inn and our Vermont ski resort is located just 5 minutes from Okemo, Jackson Gore and Ludlow, in Vermont's beautiful central lakes region. With 23 rooms, some with private Jacuzzi and Fireplace, and 7 condos, the Inn offers fine Vermont lodging plus a swimming pool, tennis, oversized Jacuzzi and a dock on Echo Lake with canoes and row boats. Ski packages and Golf packages at Okemo are available with hiking, biking and horseback riding all close at hand. The Stowe Inn & Tavern - Stowe, VT – Conveniently located, the Inn is only a short stroll through a covered bridge to the enchanting Stowe village where galleries, shops, museums, live theatre and fine restaurants flourish. Stowe, Vermont is world renowned as a four season, outdoor paradise of incomparable beauty, a perennial favorite for both sports enthusiasts and nature lovers. When it it comes to year round outdoor activities and special events, no destination rivals Stowe, Vermont. When it comes to comfortable accomodations in an historic inn in one of the most scenic villages in America, the Stowe Inn also is in a class of its own. Silver Service Inn B&B - Manchester, VT – The Silver Service Bed & Breakfast Inn offers large, luxuriously decorated bedrooms, most with their own fireplaces, king size beds, elegant whirlpool tub bathrooms and flat screen TVs. Please visit our guest rooms page for details on each room. The Inn is centrally air-conditioned. Enjoy our sumptuous three course breakfasts in a formal dining room. The inn is very conveniently located within a mile of many of Manchester's fine restaurants, art galleries, antique shops and fabulous designer outlets. Village Victorian Bed & Breakfast - Morrisville, VT – A white picket fence surrounds this three-story historic bed and breakfast, built in 1890. Full, complimentary breakfasts, including fresh fruit, home-baked goods, Vermont maple syrup, and Cabot cheese and yogurt, are served daily on fine china. A refrigerator and microwave oven are available for guests' use. Complimentary wireless Internet service is accessible throughout the house, and a laptop computer is available upon request. Use of a meeting room is available by appointment, and a portable phone with a dedicated line is provided for corporate guests. The bed and breakfast offers a living room with board games and a library. Outer porches, patios and perennial gardens provide outdoor lounging areas. The innkeepers have converted one of the garages into a gift shop, which offers a blend of creative country and elegant Victorian items. 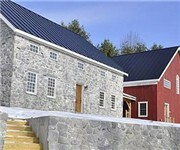 The Inn at Grace Farm - Fairfax, VT – The Inn at Grace Farm rests between spectacular Lake Champlain and the high peaks region of the Green Mountains in Vermont’s most fertile and diverse farming region. The views from the Inn are stunning, stretching over 75 miles to the south and encompassing the Northwestern corner of Vermont. Resting on 120 acres of land, conserved by The Vermont Land Trust to preserve its rich geography and unsurpassed views, this unique treasure was opened to visitors in the fall of 2008. Mountain View Inn Vermont B&B - Fayston, VT – Located just one mile from Sugarbush's Mount Ellen, two and a half miles from Mad River Glen, and three miles from Sugarbush's South Basin, Mountain View Inn Bed & Breakfast is truly in the "heart of ski country." This exceptional Vermont country inn is just two miles from Waitsfield village with all its quaint shops and restaurants, and when you are here you are surrounded by the beautiful countryside in a relaxed and friendly setting. Mountain View Inn Bed and Breakfast has all the charm of an old Vermont farmhouse with the comfort of modern conveniences including wireless internet. The inn itself is lovingly decorated with family heirloom antiques and quilts made by Suzy. The old wide pine floors have been uncovered, finished and graced with both old and new braided rugs. 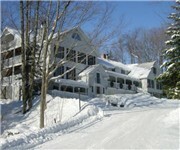 This Green Mountain Vermont inn has seven bed and breakfast guest rooms each with a private bath and beautiful views. It is truly a "home away from home" in the Vermont countryside.